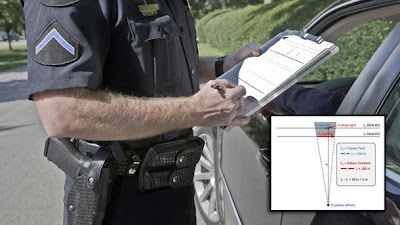 Physics paper used to beat traffic ticket,Physicist claims victory over traffic ticket with physics paper, University of California scientist Dmitri Krioukov says he's proved he didn't run a stop sign. A physicist at the University of California San Diego used his knowledge of measuring bodies in motion to show in court why he couldn't be guilty of a ticket for failing to halt at a stop sign. The argument, now a four-page paper delving into the differences between angular and linear motion, supposedly got the physicist out of a $400 ticket. If you want to use this excuse, you'll have to learn a little math -- and some powers of persuasion. The paper by Dmitri Krioukov titled "The Proof of Innocence," notes in the abstract that it's "a way to fight your traffic tickets," and was "awarded a special prize of $400 that the author did not have to pay to the state of California." (It's also posted with a date of April 1, so downloader beware.) Krioukov claims he was approaching a stop sign in his Toyota Yaris when a police officer saw him roll through the intersection, apparently without stopping, and pulled him over. Case closed — except that Krioukov says he was able to show a confluence of events that only made it seem he hadn't stopped. First, the officer was watching the stop sign saw Krioukov's car from the side, distorting his idea of how fast Krioukov was traveling before the stop. At the stop sign itself, Krioukov contended he had stopped — but the officer's view was briefly blocked by a passing car. When Krioukov started again, the officer's sense of Krioukov's speed made it seem he had never stopped at all. Krioukov told PhysicsCentral that the case and his argument were real, but that he left a flaw in his work for others to find, and sure enough a few commenters found the Yaris-based defect quickly. Leave it to a physicist to create an explanation that ends with people doubting whether the problem explained actually existed at all.